From the science of making cheese to the chemistry of onions, connect food to science and showcase hands-on cooking activities that can be done at school, at summer camp or at home with these videos and activities found in PBS LearningMedia. PBS LearningMedia has productivity tools for creating interactive learning experiences. Sign up for a free account to build media-rich learning experiences. 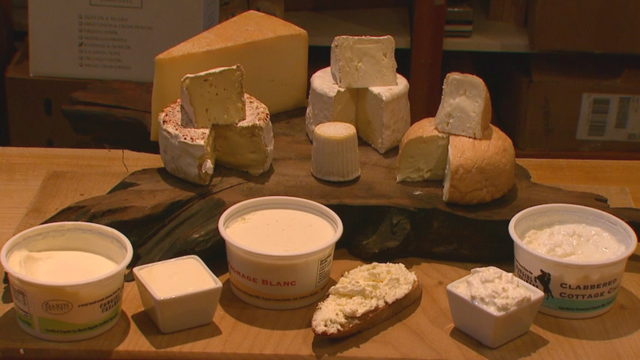 This video explores the chemical functions of various ingredients utilized during the science and art of cheese making, and how cheesemakers study the process. And learn how the cheese making process is varied to alter the final texture and taste of the cheese. In this video segment adapted from ZOOM, the cast tests two homemade solar cookers to determine which one can cook a “s’more” faster. Both designs exploit the fact that heat flows in three ways: by conduction, convection, and radiation. Though one cooker performs better than the other, they both outperform the experiment’s control setup. Acids and bases react with other chemicals in predictable ways. This interactive activity from the ZOOM Web site allows you to conduct virtual experiments on various solutions to determine if they’re acidic or basic. In one experiment, you can test the acidity of different household substances by trying to launch a virtual cork rocket. Good nutrition is an essential part of maintaining a healthy lifestyle. Nutrients provide energy and are the building blocks our bodies need to function. Learning to make sound choices about food is an important life skill, one that can be practiced by looking at and understanding Nutrition Facts labels. Learn from Misty and Tim, two teens who have diabetes, about the food choices they make to help them control their condition, in these two video segments adapted from Living With MyType2. Misty is a college student learning to adapt her dietary needs to a new environment filled with options. Tim goes grocery shopping with his mother and explains how he identifies foods as healthy or unhealthy based on their ingredients and location in the store. Students experiment with a virtual solar cooker to discover the mathematical relationship among reflection, transmission and absorption. They won’t stop there, though! Students then apply their knowledge to building and testing a solar cooker of their own invention. In an extension, students investigate how these principles can be used as sustainable energy sources for homes in Pennsylvania through passive solar heating. In this video excerpt from NOVA scienceNOW, correspondent and New York Times technology columnist David Pogue learns how cutting an onion triggers chemical reactions that change the properties of the onion. Animations illustrate how enzymes are separated from other molecules inside the cells of an onion; cutting the onion breaks the barrier and allows the molecules to chemically react and create new molecules. Cutting changes the flavor of the onion and releases molecules that can make you cry. Holidays are celebrated in many ways, but chances are they involve eating, and eating a LOT. Ever wonder why we cook our food? We do it because it tastes good, of course, and because our customs and traditions are built around it. But we also cook our food for some basic biological reasons. Some scientists think that figuring out how to cook actually MADE us human! If conversation gets a little dry around your holiday table, now you’ll have some awesome science to share with everyone! Satisfy your appetite for learning with these resources from PBS Food! The impact of healthy, organic, and sustainable food spans from industrial agriculture science to your home kitchen table, and now into the classroom with these video and recipes aimed at making food an accessibly teaching platform. In Kitchen Vignettes, a video series by Aube Giroux, see how organically grown food becomes a final dish; the program highlights Giroux’s delicious blog with recipe supplements to take the experience into your own hands. And through investigative conversation and often-muddy hands, Kelly Cox of Original Fare interviews locals to find how food is gathered and cooked seasonally. Her dynamic videos emphasize the importance of applying ecofriendly resources and using natural ingredients to create savory meals. This post was originally published June 26, 2014.